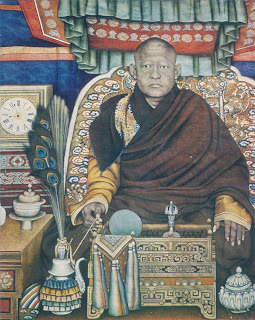 The last Bogd Khan (Holy Emperor) of Mongolia was the eigth reincarnation of that line of the Jebtsundamba Khutuktu (Holy Venerable Lord) who were the spiritual rulers of Mongolia and the third ranking 'Yellow Hat' in the hierarchy of Gelugpa Buddhism just behind the Dalai and Panchen Lamas. When Mongolia became a devoutly Buddhist country the spiritual leaders became temporal leaders as well in many instances and none were higher than the Jebtsundamba Khutuktu who was also called the Bogd Gegen or "Holy Shining One". In the same fashion as the Dalai Lamas they were held to be something like living gods; more specifically (also like the Dalai Lama) the Bogd Gegen was a bodhisattva, one who had reached enlightenment but turned his back on nirvana to continue the cycle of birth and re-birth to help other souls along the path to blissful perfection. However, following the collapse of the Great Qing Empire in 1911 the Mongolians declared their independence from the new Republic of China and declared their reigning spiritual ruler the Bogd Khan or Holy Emperor of Outer Mongolia. The last Bogd Khan was probably born around 1869 and he was identified as the reincarnation at the age of four and taken to the capital then called Urga or the "Great Monastery" where in the 1890's he built his famous (but quite modest really) Winter Palace in the main temple complex. Although of the Tibetan nobility as was traditional he was a champion of Mongolian independence and led a rather "colorful" life though many of the lurid tales told about him can be chalked up to Soviet propaganda to discredit his memory. Unlike his other spiritual/secular rulers in Tibet the Bogd Khan lived more like a regular monarch and even had a wife, the Ekh Dagina, who was held to be the reincarnation of the goddess Tara. When Mongolian independence was declared they were hailed as the new political rulers. It was probably not a bad choice since one of the feudal lords (who all claimed descent from Genghis Khan) would have likely spelled civil war and the Bogd Khan was a shrewd political operator. When the Chinese republic restored its rule over Outer Mongolia in 1919 they insisted that the Bogd Khan was their vassal, even forcing him to kowtow to a portrait of the President of the Republic in the absence of the Great Qing Emperor. There are numerous odd and funny stories about the Bogd Khan but perhaps those will wait for another post. In 1921 the Bogd Khan was liberated and restored to his throne by the White Russian general and pan-monarchist Baron Roman von Ungern-Sternberg. The Bogd Khan lavished praise on the Baron but also sent messages to the USSR and the Republic of China to try to gain the good graces of both powerful neighbors. It did no good and once the Baron's army was wiped out by the Red Army the Soviets worked through local Mongolian communist Damdin Sukhbaatar who became the new dictator. The Bogd Khan was allowed to remain on the throne, powerless but respected, until his death in 1924 (outliving his wife by one year) at which point the communists declared the reincarnations to be at an end and announced the birth of the Mongolian People's Republic. *Note, evidently the gods of Buddhism are no respectors of communist declarations and a reincarnation was found though the successor Jebtsundamba Khutuktu was not enthroned in Mongolia until 1999 when the XIV Dalai Lama made the trip to perform the ceremony. Since the writing of this, it was revealed that during the Communist period, the 9th Jebtsundamba Khutughtu was chosen secretly, and he was publicly revealed, and he returned to Mongolia and gained citizenship, and was enthroned as head of Mongolian Buddhists. He died in Mongolia in 2O12. The Dalia Lama recently said that the search has begun for the next incarnation.